uuid : 5f0b9153-646e-4325-ae3c-4a4517d171e3 templates_id: 119619 templates_uuid: "142687e4-9ba7-4d43-8707-46c5debe558c" title: "Subcontract Agreement - Create a Subcontractor Contract Online" display_name: "Subcontracting agreement" meta_keywords: "Subcontractor agreement, subcontractor contract, Sub-contracting agreement and Sub contracting contract" description: "
Make sure you do things right if you are the main service provider outsourcing work or when you are a subcontractor by using this legally binding sub-contract agreement. This subcontract agreement form sets out in clear and simple terms the process to be followed for the provision of services through other persons or companies. What is a subcontracting agreement? A subcontracting agreement is an agreement between a main contractor and a person or company (a subcontractor) delegating part of the main contractor\302\222s work or obligations. It sets out the subcontracted services, pricing and payment, change control, i.e. procedure for any changes in the services provided and the liability limit for defaulted or defective services. Do I need a subcontracting agreement? You need a subcontracting agreement when you want to subcontract all or some of your work and you want to ensure that you are protected if the subcontractor fails to perform or performs poorly. This agreement will help to ensure compliance with the terms of the main contract. Who will be responsible for any default in the services or defective services? If any default in the services or defective services appear, the main contractor remains liable to the customer under the main contract for non-performance by the subcontractor even where the customer consents to the subcontracted performance. In this agreement, the main contractor will need to be indemnified by the subcontractor for failure to perform or poor performance. Will you be able to make changes to the services? In this agreement, you will be able to make changes to the services such as price and payment, volume and specification of services. You will be able to specify them in the schedules attached to this agreement. How is the main contractor\302\222s and subcontractor\302\222s liability limited? The main contractor remains liable for the performance of the main contract, however, if the subcontractor fails to perform their obligations under this agreement, they will be required to compensate any losses incurred. The subcontractor\302\222s liability is limited if the main contractor or its customer fails to perform its obligations and it causes delay or prevents sub-contractor from performing their obligations. How can you terminate a subcontracting agreement? advice if there is pre-existing technology, IP etc. This sub-contracting agreement is governed by the law of England and Wales.
" created_timestamp: "2018-10-09 06:33:20.0" modified_timestamp: "2018-10-09 06:33:20.0" active: true created_by: 236 modified_by: 236 dcm_id: 307 url_slug: "Subcontracting-agreement" meta_description: "Prepare\302\240a subcontracting agreement for the provision of services with simple guidance from Rocket Lawyer. If you are the main contractor and you wish to sub-contract all or a portion of your work, try this\302\240sub-contract agreement for free.\302\240\302\240" time_to_complete: "20 minutes"
A subcontracting agreement is an agreement between a main contractor and a person or company (a subcontractor) delegating part of the main contractors work or obligations. It sets out the subcontracted services, pricing and payment, change control, i.e. procedure for any changes in the services provided and the liability limit for defaulted or defective services. How is the main contractors and subcontractors liability limited? The main contractor remains liable for the performance of the main contract, however, if the subcontractor fails to perform their obligations under this agreement, they will be required to compensate any losses incurred. The subcontractors liability is limited if the main contractor or its customer fails to perform its obligations and it causes delay or prevents sub-contractor from performing their obligations. More than just a Subcontracting agreement template, our step-by-step interview and guidance makes it easy to create your document. Easily create online, download, print and sign your free Subcontracting agreement in minutes. 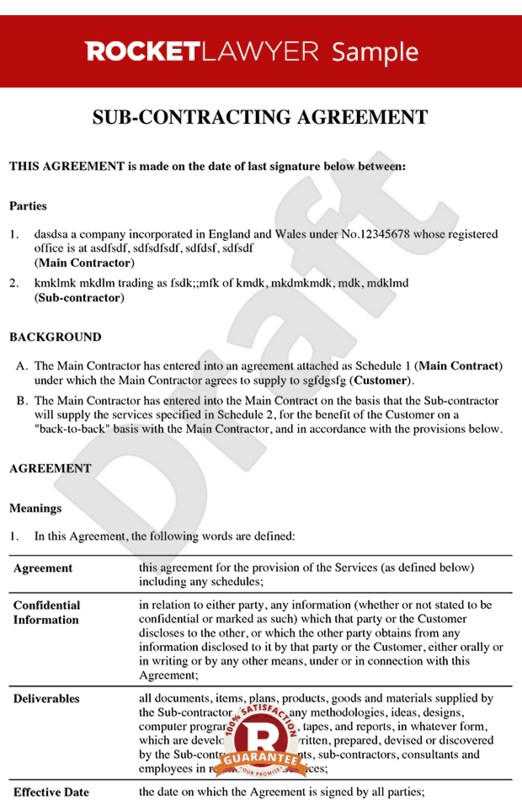 This document is also sometimes called: Subcontractor agreement, subcontractor contract, Sub-contracting agreement and Sub contracting contract.